Both US adult and childhood obesity rates have remained relatively steady in recent years, according to new reports, with rates remaining high. That puts millions of adults at increased risk for the most common cancers, including post-menopausal breast, colorectal and endometrial. AICR estimates that if everyone living in the US were to be a healthy weight, that would prevent an estimated 120,000 cases of cancer a year. New state obesity maps released by the Centers for Disease Control earlier this month show that every state has at least two of ten adults who are obese. The prevalence of adult obesity ranges from 21 percent in Colorado to 36 percent in Arkansas. The maps are drawn from the updated Behavioral Risk Factor Surveillance System (BRFSS), an ongoing survey that collects data by phone. Respondents self-report their height and weight, which is calculated into a BMI. A BMI of 30 and over is categorized as obese. The obesity epidemic remains one of the nation’s most serious health crises, was the conclusion of The State of Obesity: Better Policies for a Healthier America. Released last week, the report incorporated the updated government data and placed it into context. Released last week, the report from the Trust for America’s Health and the Robert Wood Johnson Foundation reviewed programs that can help prevent obesity, from childhood to adult. 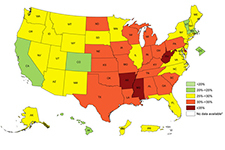 By region, the Midwest and South had the highest prevalence of adult obesity, followed by the Northeast then the West. 19 states had an adult obesity prevalence of 30 to 35 percent. Back in 1980, no state had an adult obesity rate higher than 15 percent; in 1991, no state was over 20 percent. More than 6 percent of adults are severely obese – having a BMI of over 35 – a more than a 125 percent increase in the past two decades. Arkansas had the highest obesity rate at 35.9 percent, while Colorado had the lowest rate at 21.3 percent. Diabetes and obesity: 7 of the 10 states with the highest obesity rates are in the South, and the states with the highest rates of diabetes are also in the South. People with diabetes are at increased risk of many cancers, and both diseases share several risk factors. Obesity rates were highest among Black (48 percent) adults, followed by Latino (43 percent) and White (33 percent) adults and lowest among Asian American (11 percent) adults. Although childhood obesity rates appear to have stabalized, rates have tripled since 1980. Prevention among children is key. "It is easier and more effective to prevent overweight and obesity in children, by helping every child maintain a healthy weight, than it is to reverse trends later. The biggest dividends are gained by starting in early childhood, promoting good nutrition and physical activity so children enter kindergarten at a healthy weight," the report notes as one of the major lessons. Among children between ages 6 to 11, Latino (26.1 percent) and Black (23.8 percent) obesity rates are higher than the White (13.1 percent) rate. These same increased rates are seen among Latino and non-Latino black teenagers ages 12 to 19 (2011 to 2012). More than one-in-12 children (8.4 percent) are obese in early childhood (2- to 5-year-olds). By ages 12 to 19, 20.5 percent of children and adolescents were obese. Today, approximately 17% of US children – ages 2 to 19 – are obese. Overweight and obese children are more likely to become adults carrying too much body fat, which will mean they face increased cancer risk decades later. Racial and ethnic differences are also seen among children, with slightly over one of five Latino children (23 percent) and one of five (20 percent) Black children who are obese. That compares to 14 percent of non-Latino White children who are obese. Another lesson that has emerged, the report concludes, is that healthy people need healthy communities. Reducing rates of obesity, will require a greater focus on prevention. Centers for Disease Control and Prevention. Obesity Prevalance Maps. September 2015.